The heavy winter we have had this year has got many people thinking about staying warm and what their impact on the environment is while they do so. 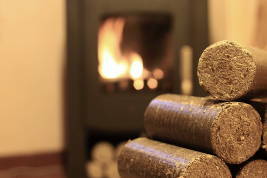 You may not have a wood-burning stove right now, but you may be considering one and want to know what your options are. Getting things lined up now, before the warmer weather pushes it out of your mind, gives you plenty of time to explore and understand your options. This month’s article will take a quick look at what those are to help you make a start. This is a hot topic right now given the debate around air quality, particularly in urban areas. For a quick reminder, check out our previous article on this issue. Combustion efficiency. This is the amount of fuel you need to burn to get heat. During the combustion process you also have waste, which will include ash, steam, or vapour depending on the type of fuel you are using. Each stove and model will have a particular combustion efficiency specification so you will need to compare those as part of your research. Heat transfer efficiency. This refers to the amount of heat that is transferred into your room from the stove as it works. The greatest amount of heat is created during the combustion process and heat will be lost in transfer, so the efficiency of any stove is an important consideration. These two factors are important and should be considered together. Gas stoves. Gas is typically more expensive than wood, but it is still significantly cheaper than grid electricity. The benefits of gas over wood are that you simply hook up to the gas supply to your home. There is no need for sourcing, buying, transferring, and storing logs, pellets, or briquettes, making it a more suitable option for smaller homes where storage space is at a premium. Gas stoves also typically have excellent combustion and a high heat transfer efficiency making it a preferable fuel to electricity. Wood-burning stoves. Wood is cheaper than gas or electricity. With wood you do not have to worry about any cuts to power or gas supply as they will continue to work independently and heat your home even under the most adverse conditions. Wood-burning stoves have a higher combustion efficiency than a heat transfer one, which means that they will heat a smaller space than a gas stove. You will also need to consider the time required to source logs and the space to store them at home – not a problem if you have plenty, but an important consideration if you are tight on space. Wood must also be kept dry and away from sources of humidity which will affect its combustion efficiency if not stored correctly. and will also give you a free, no-obligation quote when you are ready.